City officials presented a draft of their five-year housing plan at the first of several community meetings on Saturday. In November 2017, the City Council passed a resolution to establish a five-year housing policy. Since then, elected officials, representatives from the real estate and construction industries, residents and advocates conducted a citywide survey and held public meetings throughout the city. They came up with a draft policy and are now seeking outside feedback. “Housing isn’t the only thing. It may be the turkey on the table, but we’re also including the greens, mac and cheese and pie,” John Wood, the city's director of Neighborhood and Housing Services, told around 50 people at the Plaza Library on Saturday. Some of those "sides" Wood referred to include: 5,000 additional single and multi-family housing units by December 2023; a $75 million housing development trust fund; support for non-profit and private developers and less-burdensome regulations to encourage investment. The 72-page draft report condenses dozens of suggested priorities into broad strategic goals and recommendations on how to achieve them. Data-driven findings focus on several aspects of housing, among them affordability, safety and investment. While the city's housing market was found to vary almost block to block, the research found concentrations of blight on the city's east side. 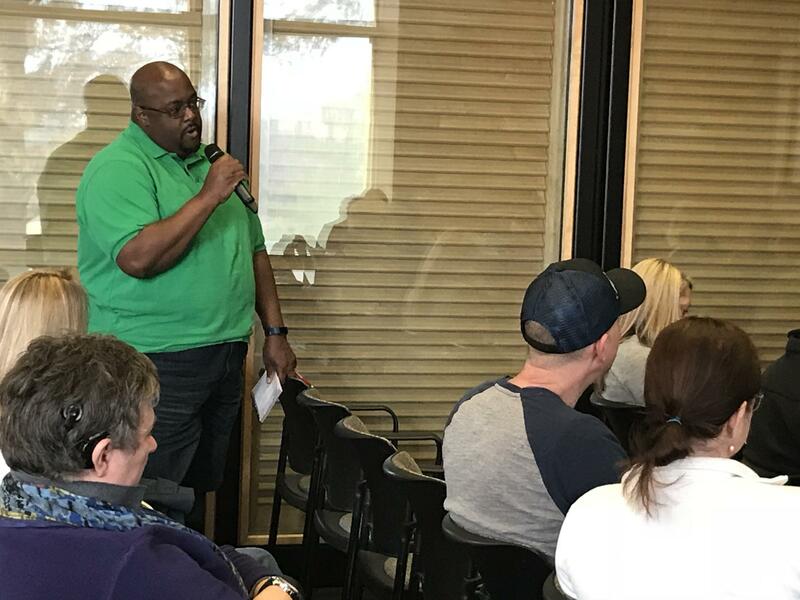 At Saturday's meeting, Councilman Quinton Lucas, chair of the Housing Committee and one of several candidates for Kansas City mayor, said the proposed roadmap has really been decades in the making. There was no shortage of feedback from the audience. Joseph Jackson said he would like the plan to have stronger provisions for energy efficiency. Joseph Jackson, a long time resident of the Santa Fe neighborhood (which extends from Linwood Blvd. to 27th Street, Prospect Avenue to Indiana Avenue), said he believes the city should pay more attention to the issue of energy efficiency. Jackson said he’d weatherized his home and is saving hundreds of dollars on utility bills. He urged city officials to include programs for weatherization, even providing training so it becomes a job-creation program as well. Jerome McKenzie, who lives on College Avenue and 39th Street in the Oak Park neighborhood, wondered how officials plan to make their improvements permanent. More than one speaker talked about discriminatory lending practices, or redlining. Laura Remy and Tom Ribera live in Historic Northeast and are renovating homes in the area. Laura Remy and her husband Tom Ribera, who have been investing and renovating homes in the Historic Northeast neighborhood for decades, said they recognize the city’s plan has provisions to work with banks and other lenders, but said those provisions don't go far enough. Remy and Ribera have worked with buyers on creative financing to circumvent banks who refuse to lend to people perceived as risky investments. Remy said those fears are not always justified. The conversation was collegial, unlike some meetings on the often-contentious issue of housing. The consensus seemed to be that the new plan is more comprehensive than earlier ones, that it acknowledges concerns that have been overlooked in the past. In his concluding remarks, Lucas tried to persuade the crowd that this effort was different. “I’m feeling very positive about where we are in the process right now,” said Michael Duffy of Legal Aid of Western Missouri, after listening to Saturday’s presentation. Duffy has been working on housing issues in Kansas City for decades and helped shape the current policy goals. “We have a history in Kansas City of doing a lot of staff work at the city level on housing plans, and those plans get put on a shelf and more or less forgotten,” he said. The city’s Housing Committee will hold four more community meetings after Thanksgiving. The Kansas City Council approved a sweeping proposal Thursday to revitalize some of the poorest parts of eastern Kansas City, Missouri. Residents of the poorest parts of Kansas City are tired of city leaders making promises about investing in the city's east side. A sweeping proposal to revive the eastern side of Kansas City, Missouri, received support and skepticism from neighbors Wednesday at a public hearing.